Can't continue Daily Missions after the 00:00:00 timer?, or are you wondering why you can no longer pick up any Powerups? Don't worry, these are just normal and you can learn here why. Daily Challenges will generate random words related to the game each day and the number of letters will determine the difficulty of the task. 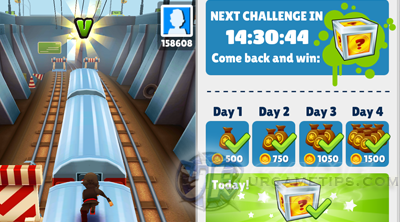 - Complete Daily Challenges each day and increase your reward! will temporarily replace them until you complete the Daily Mission. hits 00:00:00 to update and get the new daily challenge. - Coins from Day 1 to Day 4. - Complete a 5 Days streak to get a Super Mystery Box! will go on until the streak is broken.